Years ago, Julie (Serio) Gibson contacted me and asked for copies of the paper from the year that we were both on staff because she no longer had them. I'd kept my copies but of course, as soon as I needed them I couldn't find them—I could only find issues from the prior year. Eventually the missing issues showed up, but I'd lost Julie's contact info. I figured I would just scan them and make them available to whomever wanted them. What followed was the standard routine of having the newspapers but no working scanner, or a working scanner and the papers misplaced or in storage, repeat ad nauseum. Finally, finally, I found the newspapers again, had a new scanner that actually works with Windows 7, and decided to scan them while the window of opportunity remained open. So this is for you, Julie. I'm sorry it took so damned long to get it done. These are scans for the copies that I have available, namely those from the two years that I was on staff plus whatever else I have. This is the sort of ephemera that disappears completely and it's a shame: it makes a nice companion-piece to the yearbooks. We had different staffs and we had different focuses. 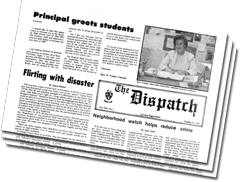 I also included the tabloid newspapers that were created during the school district's annual Leadership Academy for the years 1981 and 1982. I will scan and upload other issues if they become available. This website has no affiliation with Savanna High School nor the Anaheim Union High School District whatsoever.